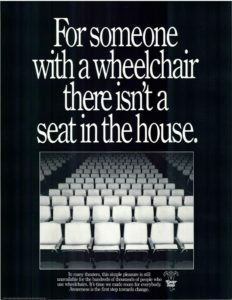 Historical Americans with Disabilities Act (ADA) poster on movie theater accessibility. Since I was a child, I’ve loved going to the movies. Because of my disability, the big screen has allowed me to escape reality and indulge in adventures I might not otherwise have. I’ve thrilled to each new innovation — from THX sound to IMAX screens to 4K digital projection. So it fills me with misgivings that the latest modernization to the movie-going experience has made it worse for me and others who use a wheelchair. I’ve always been independent. For most of my youth, I enjoyed doing things like going to movies and malls on my own. It gave me a sense of autonomy. At theaters, I always transferred out of my wheelchair to take advantage of the theater seating. While not as plush as today’s luxury seating standards, it was still better than sitting in a wheelchair — especially when the theater’s center aisle was a steep ramp. Over the years, I’ve fought my share of battles at the movie theater. For several years in the late 1980s and early ’90s, one local cinema chain repeatedly demanded that they take my wheelchair from me during the show for fear that it was blocking the aisle. That ended abruptly when I told the manager he could take my wheelchair if he left his legs as collateral. After all, what would I do if I had to leave to go to the bathroom or if there was an emergency? I couldn’t very well rely on someone making minimum wage to bring me my chair during a fire. Now the battle is with advanced seating, which seems to be all the rage as theater chains invest in premium seating and mobile apps for ticket ordering. For the record, this isn’t just about online ordering. These same problems come up when buying tickets at the window. But with the advent of online sales, the “choose your seat” option has become more prevalent. At first, I was thrilled with the idea of buying my tickets in advance. 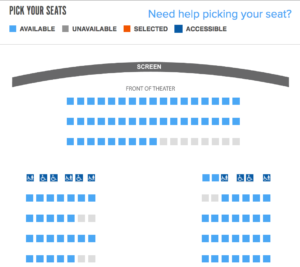 When the theater started requiring me to pick my seat (or seats, now that my wife is with me), however, I discovered that once again the average person doesn’t understand the needs of the average wheelchair user at all. Standard seating selection at a local theater. I picked a matinee to maximize available seats. Notice the “Accessible” seating consists of a single row. This is because things like the advent of stadium seating has seriously curtailed seating choices for those of us in wheelchairs. Now, conceivably, I could sit on the end of the first three rows (assuming there are no stairs, but this doesn’t say). So, let’s assume there are stairs there, too. Next, we’ll look at the seating choices themselves. Note that the accessible row includes three different seating icons. A light-blue square denotes an available standard seat, as on the rest of the chart. A dark-blue wheelchair icon is for wheelchairs, and a dark-blue wheelchair/person icon is for reserved companion seating. This all seems logical. But let’s look at the fine print. Mouse over those accessible seats and you’ll notice something interesting. To start, the wheelchair seat isn’t a seat at all. It’s a wheelchair space. Note the bold text. “It is not a seat.” So, that’s cool. I’m glad they have a space available for wheelchair users who are not as independent as I am. That gives them a spot to park without blocking the rows behind them. But why do they have to pay the same price for a spot on the floor as someone else who gets a luxury seat? On to option #2. The companion seat. 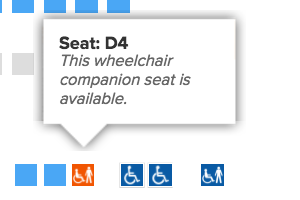 As you can see in the image on the right, Seat D4 is specifically for a wheelchair companion. 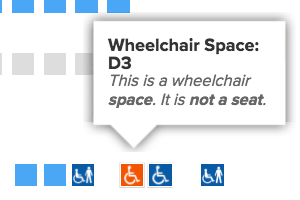 Meaning, if a wheelchair user sits in D3, their friend/date/spouse can sit in seat D4. Nice! But where does that leave me? Oh sure, I guess I could take D4, the companion seat. And my wife could sit in D5, which is a standard seat. But where do I put my wheelchair? I’d have to park it in D3, which means I’m taking someone else’s spot. And in the likelihood the theater sells D3, I’m going to be without my wheelchair. And it’s 1989 all over again. I’d be in one place, and my wheelchair would be someplace else! While the wheelchair spaces and companion seats might resolve one issue, it doesn’t fit every scenario. Some wheelchair users want to transfer out of their chairs. For others, that’s not an option. Some wheelchair users come alone, and need to be with their chairs at all times. Some wheelchair users bring a companion. Or come with multiple people. Whom they would like to sit with. A number of these concerns could have been avoided if movie theater chains had gathered a focus group of wheelchair users. I’m sure a single focus group pulled at random would have pointed out that all wheelchair users are different. For a moment, consider an adult wheelchair user who wants to go to the movies with his wife and two kids. 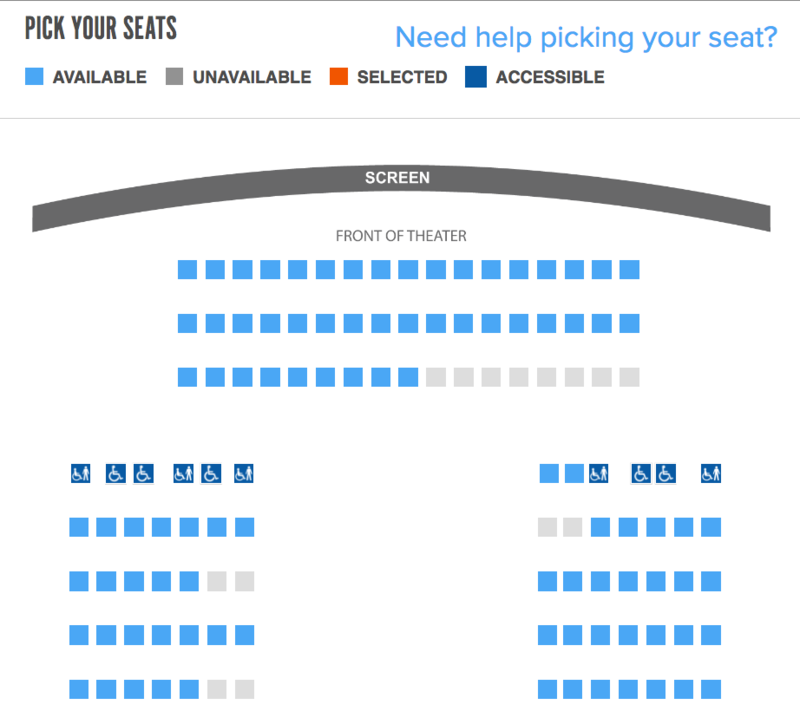 Given the seating options above, there is NO option that allows him to sit with his family unless he stays in his wheelchair (seats D3-D6), or sits in another row (assuming any other row is at least partially accessible). And what about a guy in a wheelchair who wants to go to the theater with his co-workers? While they’re all sitting together in the stadium seating, he has to sit alone (or with a friend) in a different section of the theater. Since when did “separate but equal” become acceptable in our country? If theater chains wish to avoid losing more patrons, I think they need to take a hard look at their accessible seating options. Some theaters have made great advances in this area, but others are doing only the bare minimum. And while I have singled out movie theaters, this really applies to any kind of reserved seating arrangement (including concert venues, sporting events, etc.) where wheelchair users and their companions are routinely given fewer options. I won’t even get into the logistics of finding the best seat in the house. Famed film critic Roger Ebert once claimed you should sit in the center, half as far back from the front as the screen is wide. With these few seating options available, getting the best seat in the house is even more unlikely now. While I can’t fully appreciate the difficulties you experience, your logic has so many holes, I don’t know where to start. Starting from the advent of online ordering, your article is pure conjecture with no real life example to back up your claims. First , why pay the same price if you are using your wheelchair for seating? You pay for the movie and a spot in the Theatre, not the seat. Second if you want to sit in the Theatre seat, where do you leave your chair? In one of the spots provided for chairs of course. 30 years of going to movies, I have only seen one or two attendees in a wheelchair. The image you provide has 5 spots for a chair and it’s almost a certainty that one will be free, if not all. The Theatre will not charge you extra to leave your chair in a free space if it is not being used.third, going with family or a group. There is no guarantee that any group will get to sit together. But even in the wheelchair accessible front row, you can sit with at least two or three people. But the key is to pre-order early enough if you want to sit with a group. Movies are first come first serve. Lastly the companion seat. These seats are available for anyone, not reserved only for companions. It’s understood that if a person who needs assistance comes with a companion, they can use the companion seat and the original purchaser finds another seat or is reimbursed. That row is actually the best in my opinion. The problem here is you are just pointing out possible issues and complaining without a real life experience to back it up and offering no solutions. What are the great strides that some cinemas have made? Explain in more detail. 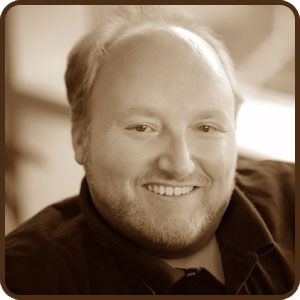 Will, thanks for taking the time to comment. The intent of this post is merely to point out the difficulties that the disabled (in this case, wheelchair users like me) have when doing something everyone else takes for granted. As I pointed out in the article, the situation has improved since the ’80s with advent of the Americans with Disabilities Act (ADA). But ADA doesn’t guarantee people with disabilities can live their lives free of obstacles. It’s up to all of us to point out where improvements can be made. All my concerns are based on real life experiences. These are not hypothetical. I have suggestions for how things can be improved, but as one person who works for a large theater chain told me, they aren’t “cost effective.” The sad truth is that businesses would rather lose some customers rather than paying to accommodate all customers.